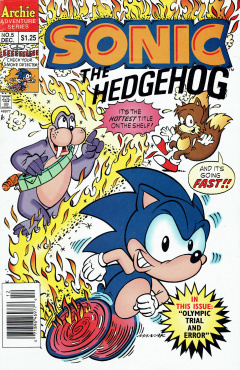 Sonic the Hedgehog 5 is the fifth issue of the Sonic the Hedgehog comic series. It was released in December 1993. This comic features two stories: Olympic Trial and Error, and Chomp on this, Chump!. It also features two featurettes: Sonic's Ten Second Workout and Fast Food!. 3 Chomp on This, Chump! Tails and Sonic the Hedgehog are outside playing baseball, Sonic pitching the ball and catching it himself due to his super speed. He takes the ball and hits it with his bat, a long fly ball, and runs off to catch it, only to run into a building. Tails runs up to check on him. They both look up to see the building is Robotnik Stadium, with a Swatbot outside introducing the structure to the duo. It tells Sonic that Robotnik challenges him and the Freedom Fighters in the first Robotropolis Olympic Games. It states that if they win at least one event, Robotnik will return Mobius to normal, and, if none are won, then all the Freedom Fighters must turn themselves in to be roboticized. Sonic, speaking for his friends, accepts the challenge. In Knothole Village, the Freedom Fighters react strongly against the challenge, thinking it's a trick by Robotnik. Despite the risk, Sonic thinks they can't lose as he's the best athlete in Mobius and will enter all the events personally. Tails, wanting to join his team, is declined by Sonic. Antoine D'Coolette tries to impress the others with his fencing skills, to Rotor's fear. Tails, having been denied from joining the team, sulks into his room to watch the games, but later decides to make a sculpture of Sonic for his return. The next day, the Freedom Fighters march into the stadium. Robotnik is sitting in a booth in the audience with a number of badniks who note their arrival. Robotnik asks the Swatbot beside him if Sonic is wearing his special sneakers. The Swatbot acknowledges that he is not, that it personally stole his sneakers while he was swimming in a pond and replaced them with energy-draining sneakers. The Swatbot then tells Robotnik that it threw the sneakers in the trash, upsetting Robotnik as he wanted them as a trophy. With that behind him, he announces the beginning of the games. Sonic prepares for his events by doing some laps, but before he can start, he feels woozy and falls to the ground. The Freedom Fighters run out to help him, realizing their one hope of winning is down for the count. With Sonic out, Robotnik orders his Swatbots to bring in the portable roboticizer in anticipation of his win. Suddenly, Sally Acorn announces that she and the others wish to take Sonic's place to win the Olympics. Robotnik accepts the new conditions. Antoine is first up, performing the long jump. He dashes for the sand pit and jumps, only to be knocked aside, mid-air, by a badnik. He falls flat on his face a short distance away. In the swimming portion, Sally is representing the Freedom Fighters. Despite claiming to be the best swimmer in the Great Forest, she's easily overtaken by an Octus. The third event, weight lifting, is being done by Rotor. He is able to successfully lift up the barbell, but he and the barbell both are lifted up by a Swatbot. The last event is up, a race, with Robotnik choosing his fastest flying Buzzbomber for his team. Meanwhile, in the Robotropolis junkyard, Tails is looking for parts for his sculpture. He comes upon Sonic's special sneakers, which he takes and dashes off quickly to the stadium. Back at the race, Antoine is representing the Freedom Fighters, but he is not doing well, with the Buzzbomber way ahead of him. Sally thinks they are done, when Sonic dashes behind her, with his special sneakers on. He dashes off to take care of the race. At the finish line, the Buzzbomber is taunting Antoine by waiting to catch up. Sonic suddenly dashes around the Buzzbomber, leaving him covered in dust. It decides to ignore Antoine and cross the finish line. Proclaiming victory, Sonic points at the finish line, showing that he flew backwards and crossed the starting line. At the finish line, Antoine crosses, passing out from fatigue. Robotnik ignores his promise and orders Sonic destroyed. Sonic jumps into the portable roboticizer in a spindash, destroying it and causing Robotnik and his badniks to run from the stadium. Sonic congratulates Tails for his work, while Sally attends to a dazed Antoine. Sonic is teaching the readers is ten second workout. First he spins his feet very fast, then he spends a few seconds running around the room from floor to ceiling. He then takes it to the extreme and takes a three to four second dash around the world. He returns back to Knothole, letting the reader know that they can do Rotor's eight-second workout if that was too slow: eight seconds of trying to touch your toes, and the rest of the day to stand back up. Rotor walks into the Knothole kitchen showing a magazine offering an ant farm, walking in on Sally, Tails and Sonic trying to pull extremely stuck pancake batter from Sally's mixing bowl. They get it out, Sonic knocking into Tails, but Sally thinks she put too much flour and not enough water. They look over to Rotor, who shows them the magazine ad. Without hesitation, despite Sonic thinking watching an ant farm is boring, he sends out the mail order. However, the ad is a scam by Robotnik, who receives the mail order. Robotnik orders one of his Swatbots to send Rotor a package, before whatever is in it eats it. Back at Knothole, Rotor has received his ant farm from Robotnik. He shows off the can which holds the ants, which sound hungry. He opens it up, revealing one large muscular termite who jumps out onto a table. Rotor looks it up in a book, finding out it is a 'Termite-nator', that can eat anything wood or paper. It eats the book then eats a wooden chair. From a piece of paper left, Rotor finds out that the termite gets larger as it eats more wood. Done with the chair, it has grown the size of a human being. Sonic realizes, with the Great Forest made of wood, the termite will eat the forest until nothing is left. Some time passes, and Sally witnesses as the now giant termite eats the last piece of furniture in Knothole. Sonic runs over to her with the last book: Sally's cookbook. Sonic asks her if it's the one she used to make the pancake batter from earlier, which it is. Sonic comes up with an idea and asks her to repeat the recipe, so he can make it quickly. The recipe calls for ten cups of pancake flour, a dozen eggs, and eight sticks of margarine. By Sally's mistake, she added only a teaspoon of water. Sonic mixes the concoction and runs out of Knothole with it. He sticks the batter in a hollow log and returns, giving the log to the termite. He eats it, only to end up with his jaws glued shut from the batter. Rotor comes over to the termite to take a closer look, finding a 'Made in Robotropolis' label. He decides to change its wires a bit. In Robotropolis, Robotnik is mad that the termite has not devoured all of the Great Forest yet. A Swatbot enters telling him a large package has been delivered. Robotnik tells it to quickly open it up. The termite appears, grabbing Robotnik and demanding metal, forcing Robotnik to order his Swatbots to keep giving it metal so it doesn't eat them. Sonic is explaining the advantages of being the world's fastest hedgehog, such as being able to eat food before it gets cold. Sally then calls out for dinner, but before she can finish telling him to come before its cold, he arrives and eats it. Sonic is proud of his achievement, but his stomach starts to feel sick. Sally then comes out with a plate of hot food, asking Sonic why he ate a bowl of wax fruit. Sonic the Hedgehog 2 badniks are introduced. The cover of issue 6, shown in the Sonic-grams segment, is different from the final design.